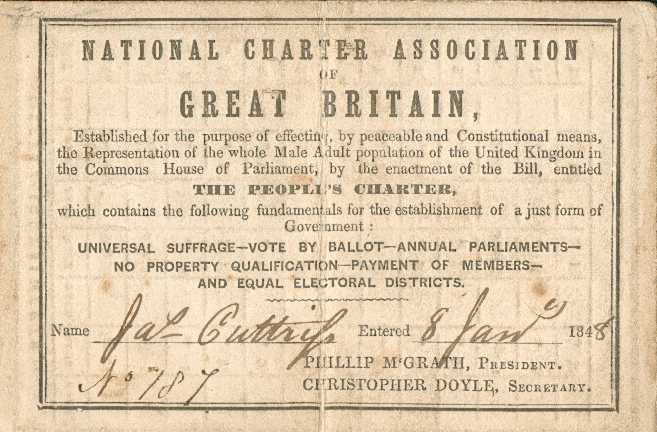 The National Charter Association was founded at a conference in Manchester in February 1840, putting the movement on a sound organisational footing following the rejection of the first Chartist petition and the suppression of the Newport Rising. NCA membership card (front and back) 1843The NCA became not just the first mass working class political party (as the historian Dorothy Thompson observed), but the first national political party in history (in the words of Professor Malcolm Chase), and at its peak, it had 400 branches and 50,000 members. The front of the card includes a rich mix of messages, both textual and symbolic. Below the name of the organisation, which signals its aspiration to nationwide status in its full name of the National Charter Association of Great Britain, are the six points of the Charter, and the motto “Truth is our guide”. There then follows a reminder of the stark fact that just 800,000 men out of an adult male population of seven million were entitled to vote. Beneath entries for the holder’s name, membership number and joining date are the names of the NCA’s national officials: Philip McGrath, president; Feargus O’Connor, treasurer; and Thomas M(artin) Wheeler, secretary. 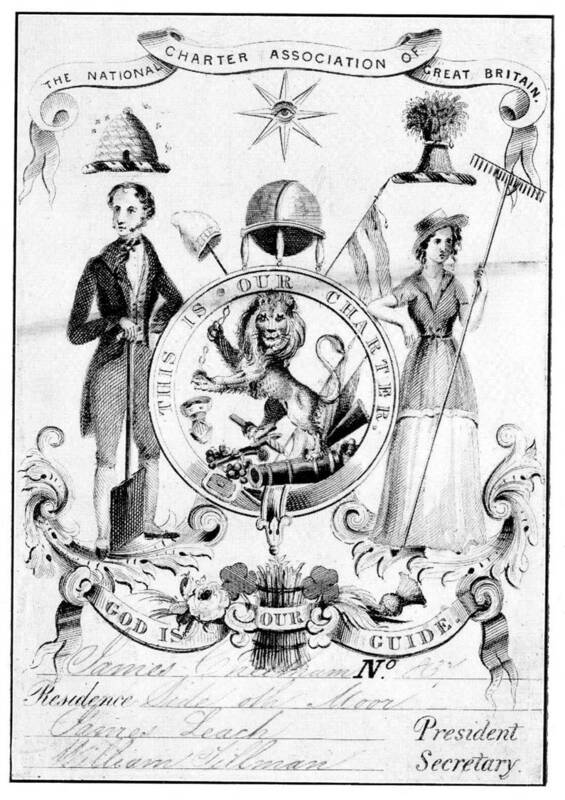 It is worth noting the images that appear on the card: a cap of liberty; a beehive and a bushel of corn representing industrial and agricultural workers; decoration surrounding the motto denoting the different parts of the country, including an Irish shamrock and Scottish thistle; and finally what appears to be a fasces (although it lacks the usual axe head), symbolising collective power and governance. The membership card shown above dates to 1843, and the blank subscriptions record on the reverse shows that it would have been valid between October and December of that year. NCA membership card dated 1840. Thousands of cards must have been issued over perhaps a decade (the NCA continued in name at least until 1858, but had ceased to have a mass membership by 1850), but tiny numbers have survived. The earliest, now held by Greater Manchester County Record Office, was issued to James Cheetham. Although undated, it carries the authorisation of James Leach as president – an office he held from the launch of the NCA through to 1842. This same card, from which the image on the right is taken, was reproduced in a 1913 book titled Landmarks of Local Liberalism. 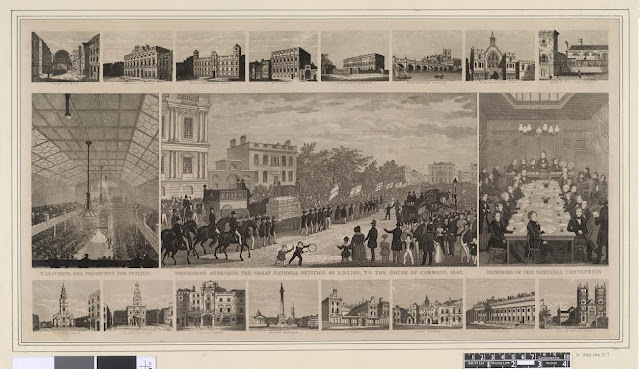 Much of the text and imagery found in the 1843 card can already be seen in this earlier version. 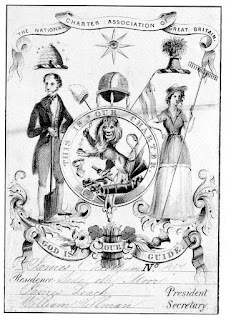 The main differences are the inclusion of the masonic all-seeing eye; the male and female figures with spade and rake respectively; and the lion, which appears to be trampling a cannon and pistol. The text “God is our guide” also appears prominently. 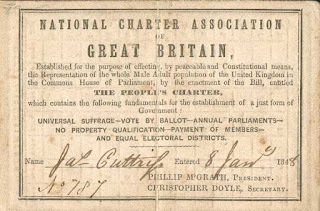 A later example of an NCA membership card was issued to James Cuttriss in January 1848, and consists entirely of text setting out the objectives of the organisation. Shown right, it is still owned by Cuttriss’s descendants. In addition to these, I have seen only one other NCA membership card – one similar to my own, which someone showed me at a family history event in Norfolk. Unfortunately, I failed to get their contact details. Does anyone know of more?